If you are a subscriber to the theory of momentum, the Carl Pavano-Lance Berkman encounter in the seventh inning was the most pivotal (and controversial) at bat of the game, shifting control back into the Yankees’ favor. The Twins had just tied the score at two in the bottom of the previous inning on Orlando Hudson’s solo home run and, following Delmon Young’s triple, Minnesota appeared to have Andy Pettitte reeling. Unable to score Young from third, the Twins set out to keep the Yankees scoreless in the top of the seventh. With no outs and Jorge Posada on first with a lead-off walk, Pavano gave up a double to Berkman, which scored the catcher from first. According toFangraph.com’s Play Log, Berkman’s RBI double supplied the defending champions with their largest amount of WPA (wins probability added)of the night, helping put the Yankees in front for good. Of course, that double may never have happened had a certain pitch been called a you-know-what. In the match-up, Pavano positioned himself well, getting two-strikes on Berkman, who had already homered earlier in the evening. While working him away on the first three pitches, Pavano buzzed a fastball inside for what appeared to everybody and their mother to be strike three. Everybody, that is, except home plate umpire Hunter Wendelstedt. From his position at second base, Hudson, who had tied the game in the bottom of the last inning, jumped up and down, demonstrating his dissatisfaction with the call. Joe Mauer held the pitch a split-second longer than usual. Pavano stared towards home, presumably asking what Wendelstedt had seen. While the majority of viewers probably figured that Wendelstedt took that Pavano pitch to be the opportune time to blast out a tweet (“Awesome seats for #Yankees-#Twins game. Sneaky Petes afterwards! #MLBPlayoffsRox”), Wendelsted’s call was consistent with his other calls. 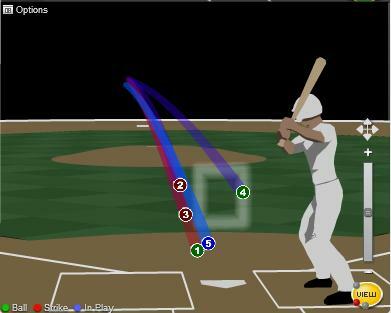 In the end, Yahoo.com’s Jeff Passen counted 31 missed calls by the home plate umpire, but also noting that Pavano was often the recipient of strike calls that were actually out of the zone (like his first strike to Berkman in the offending at bat). Simply put, while the call was blown, you can’t complain about a botched call on one hand while being the beneficiary of some questionable strikes on the other. Regardless of the umpire’s indiscretions, the Twins will head into Yankee Stadium hoping to survive the weekend and somehow bounce back from two games in the hole. That feat has been accomplished exactly four times since the eight-team playoff format was introduced in 1995. Seattle managed to win three straight against the Yankees in 1995 while the Red Sox knocked Cleveland out in 1999. The A's lost two series after being up by two games, losing to the Yankees in 2001 and the Red Sox in 2003. Unfortunately, unlike the Twins, who have to venture into the city that never sleeps on their road to recovery, three of the four teams made their comebacks when returning home for two games.